Cancun, found at the point where the Mexican Gulf meets the Caribbean Sea, is a paradise resort offering beaches, nightlife and natural beauty. Don't be put off by Cancun's reputation as a go-to Spring Break destination: this place has plenty to offer travelers of all types. We particularly recommend the Mayan ruins at Chichen Itza for history buffs and the Xcaret EcoPark for those who love wildlife. 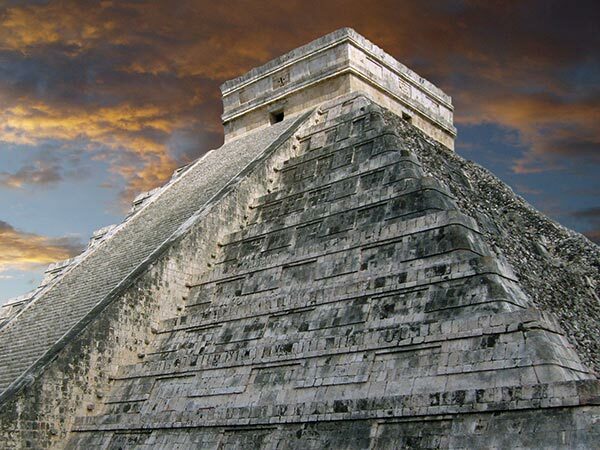 Chichen Itza, a UNESCO world heritage site, is the most impressive of all of Mexico's Mayan ruins. The Mayan civilisation, best known for its art, architecture, written language and astronomy, was powerful between about 2000 BC and 1500 AD, with Chichen Itza being built in around 800 AD. The four square mile Chichen Itza site, found in the centre of the Yucatán Peninsula, is most famous for its pictured central Kukulkan Pyramida (aka 'El Castillo')—a 24-metre high structure with four flights of 91 steps on each of its sides leading to a central pedestal. Other important parts of the site include the Sacrificial Cenote (a 90 foot deep sinkhole into which sacrifices were thrown), the Temple of the Warriors (with numerous 130 foot columns), the Observatory (known as El Caracol or 'the Snail' on account of its shape) and the Pelota Ball Court (the largest of Chichen Itza's eight ball courts). where? Chichen Itza 77500, Mexico. Tel: 52-987-2-09-72. 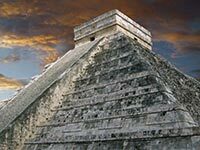 Chichen Itza is a two to three hour drive from Cancun and a two hour drive from Merida. when? 7 Days a week, 8 am to 5 pm (though visitors already in the park can stay for the sound and light show). £$€¥ Site admission is 237 Pesos (though under 13s and over 60s go free). Xcaret is a substantial ecopark devoted to Mexico's flora, fauna and culture. There is a lot to see and the ticket price is high—so make sure you arrive early and spend the whole day here. As for flora and fauna, Xcaret boasts a 37,000 square foot butterfly pavilion, an orchid house, a manatee lagoon, a deer shelter, a bat cave, and islands inhabited by monkeys and jaguars. Traditonal culture can be observed in a recreated and repopulated Mayan village, or by taking in the park's 'Spectacular Night'—performed every day by 260 artists and showcasing Mexico's past and present music, dance, costume and history. Another significant draw are the water activities offered by the park: visitors can swim or snorkel in lagoons, natural pools and underground rivers, can try their hand at 'Snuba' diving, and can also swim with dolphins and sharks. where? Xcaret Ecopark, Highway Chetumal-Puerto Juarez Km 282 Solidaridad, Quintana Roo, Mexico. Xcaret is 35 miles south of Cancun Mexico International Airport and 4 miles south of Playa del Carmen. when? Xcaret opens 365 days a year from 8.30am to 9pm in winter and 10pm in summer.